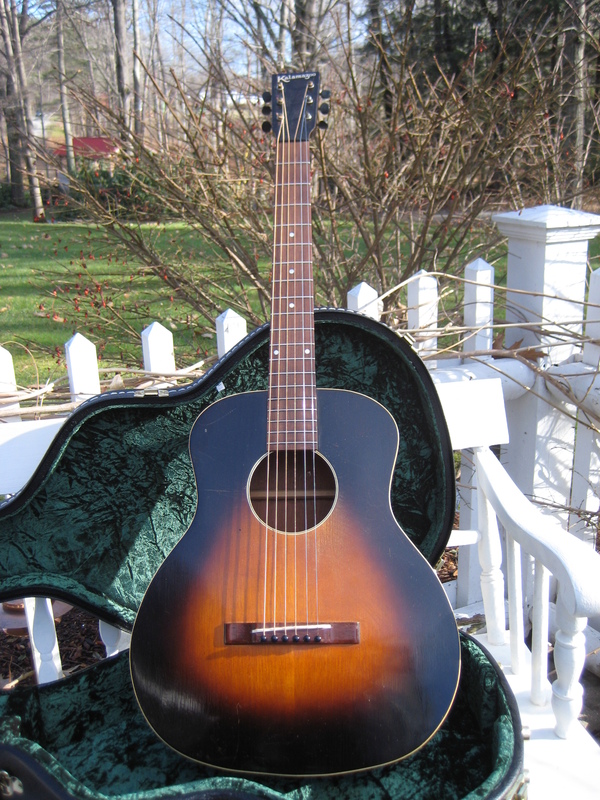 Gibson-Kalamazoo KG11, one of the rarest we’ve found, a medium sunburst 1934 pre pick guard with a 2 piece seemingly seamless top and the square headstock and the white black white sound hole binding. This here is a grail, pure finger style joy. Date verified in “Spann’s Guide to Gibsons” per the clear FON of 1178 ink stamped on the neck block. We find the ’33-’34s to be the lightest built of the KG-11 series and always sound the very best. This one is crack free and totally original and has the gorgeous crazing in the burst. Small bit of pick scratch around the sound hole to prove she’s been loved but No abuse ever on this lady! Impeccable neck set by David Hatchard with pro set up of 3-2 action and plenty of string break over the new bone saddle. Adirondack top, mahogany back and sides with a nice light colored Brazilian rosewood divot free fretboard and lacquered Brazilian rosewood original bridge. 1 3/4″ at the nut and did I mention….crack free! New well fitting hard case. 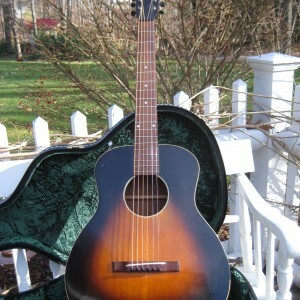 This guitar reaches out from the Great Depression and sez…play me.